113 Beacon is located on the south side of Beacon, between Arlington and Berkeley, with 111 Beacon to the east and 115 Beacon to the west. 113 Beacon was designed by architect Nathaniel J. Bradlee and built ca. 1863, one of two contiguous houses (113-115 Beacon) built for the estate of Mace Tisdale, who had died in November of 1861. 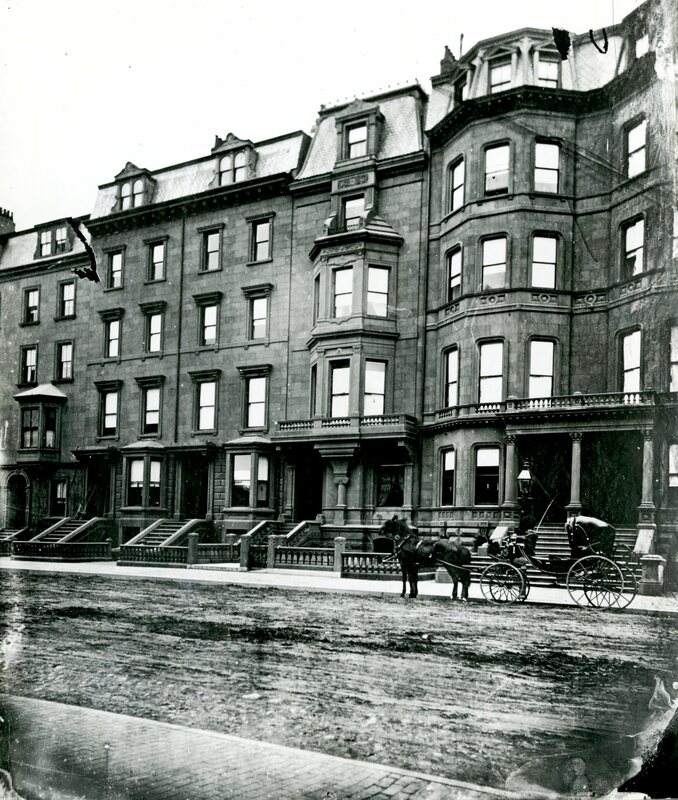 The land on which 113-115 Beacon were built was purchased on November 12, 1862, by Seth Pettee, trustee for the estate of Mace Tisdale, from William Warren Goddard and Abbott Lawrence. It was part of a tract of land William Goddard and Abbott Lawrence’s brother, T. Bigelow Lawrence, had purchased from the Commonwealth of Massachusetts on August 1, 1857. That tract included all of the land on the south side of Beacon Street from Arlington to Berkeley. Click here for an index to the deeds for 113 Beacon. 113 Beacon became the home of Mace Tisdale’s only surviving child, Frances Ann (Tisdale) Bradlee, widow of John Rice Bradlee. She previously had lived at 51 Chauncy. 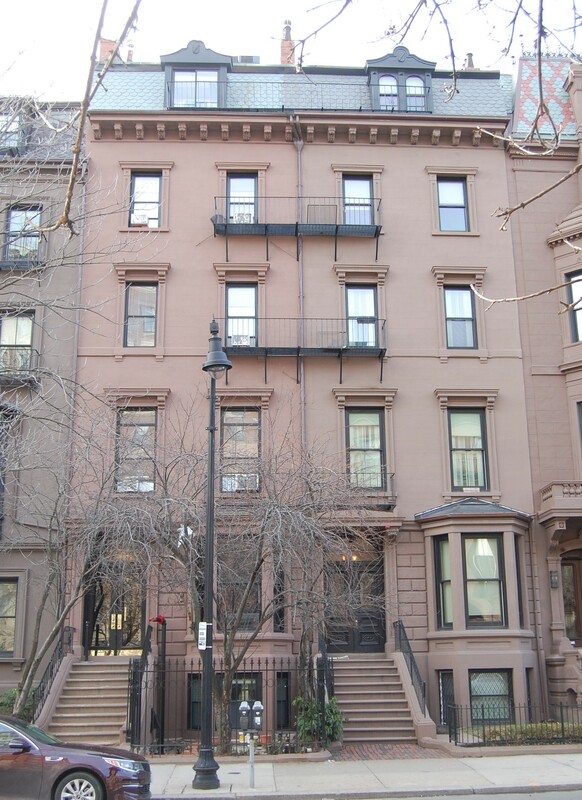 115 Beacon became the home of her son and daughter-in-law, dry goods merchant John Tisdale Bradlee and Sarah Elizabeth (Goddard) Bradlee, Although they shared the same surname, it does not appear that the architect, Nathaniel Bradlee, and John Rice Bradlee were closely related. Frances Bradlee died in July of 1867. After her death, John and Sarah Bradlee moved to 113 Beacon. The Mace Tisdale estate continued to own both houses until July 11, 1887, when they were transferred into John Bradlee’s name. John Bradlee died in May of 1908. Sarah Bradlee continued to live at 113 Beacon until her death in January of 1923. Their unmarried children — Sarah Frances Bradlee, Mary Elizabeth Bradlee, Josephine S. Bradlee, and Charles W. Bradlee — lived with her. 113 Beacon was not listed in the 1924 Blue Book. On December 29, 1923, 113 Beacon was acquired from the estate of Sarah Bradlee by Julia E. (Frost) Raymond, the widow of Augustus Raymond, of Larchmont, New York. On February 25, 1924, she transferred it to her daughter, Isabel (Raymond) Duane, the wife of Harry Brewerton Duane. Harry and Isabel Duane made it their home. They previously had lived in Brookline. They also maintained a home in Manchester. Harry Duane was president of the Touraine Confection Co., manufacturers of chocolate candy. The Duanes’ three children – Harry Brewerton Duane, Jr., Marian Livingston Duane, and Robert Constable Duane – lived with them. Harry Duane, Jr., married in October of 1929 to Eleanor Spencer Holmes. After their marriage, they lived in Cambridge until about 1935, when they moved to 113 Beacon to live with his parents and siblings. Harry Duane, Jr., was associated with his father’s confectionery business. They continued to live there for several years, and then moved to Marblehead. Marian Duane married in 1937 to Edward Lawrence Peirson. After their marriage, they lived in Salem. Robert C. Duane had moved from 113 Beacon by the late 1930s. Harry and Isabel Duane continued to live at 113 Beacon until about 1940. The house was shown as vacant in the 1941 and 1942 City Directories. The property subsequently changed hands and on October 14, 1942, it was acquired by Max Feer, who owned a grocery and variety store, and his wife, Emma (Korb) Wolffers Feer. In December of 1942, Emma Feer applied for (and subsequently received) permission to convert 113 Beacon from a single-family dwelling into a lodging house. At the same time, Elizabeth Krauss converted 115 Beacon from a single-family dwelling to a lodging house. Connecting fire balconies were constructed between the two buildings. By 1944, the Feers had moved to 113 Beacon. They previously had lived at 151 Beacon (where they had moved in 1943). 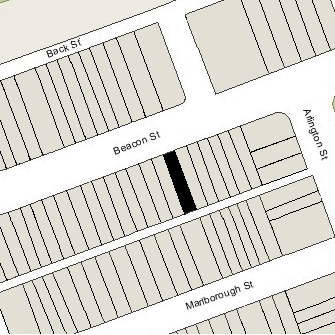 They continued to live at 113 Beacon in 1945, but by 1946 had moved to 24A Dartmouth, where his store also was located (he died in January of 1947). On May 4, 1945, 113 Beacon was acquired from the Feers by Leon Meyer Wolffers, Emma Feer’s son by her previous marriage to Meyer Lion Wolffers,. Leon Meyer Wolffers and his wife, Frances (Shuman) Wolffers, lived in Dorchester. They continued to operate 113 Beacon as a lodging house. On October 4, 1946, 113 Beacon was acquired from Leon Wolffers by Mrs. Lillian C. (Barbanti) Luderer, the former wife of Walter P. Luderer, who operated it as a lodging house. She previously had lived at 527-529 Beacon. She continued to live at 113 Beacon until 1963. 113 Beacon subsequently changed hands. It continued to be operated as a lodging house. On July 18, 1978, 113 Beacon was purchased by Ronald V. Livesey, trustee of the 113 Beacon Street Realty Trust. In March of 1982, he applied for (and subsequently received) permission to convert the property from a lodging house into thirteen apartments. As part of the application, he proposed erecting a three-car garage at the rear. In August of 1983, he filed to amend the plans, adding an additional story on top of the garage to be used as living space. On February 24, 1988, Ronald Livesey filed a condominium master deed to convert 113 Beacon into thirteen condominium units, the 113 Beacon Street Condominium. On June 9, 1990, the Neworld Bank for Savings foreclosed its mortgage and took possession of 113 Beacon. On August 9, 1990, the bank transferred the property to its subsidiary, the NWB 113 Beacon Street Limited Partnership, and on December 21, 1990, it removed the previous conversion of the property into condominiums. On March 20, 1992, 113 Beacon was acquired by Paul G. Roiff, trustee of the 113 Beacon Street Trust, and on December 3, 1998, it was acquired from the trust by EB Properties LLC (the manager of record of which was the Heath Management Co., Inc.; Paul Roiff, president). 113 Beacon remained an apartment building in 2015.